(Sheffield, U.K.) Team Canada kicked off the 2018 Continental Clash with split decisions on Monday as the Canadian Senior Women’s National Team defeated Japan 59-52 and the Canadian Senior Men’s National Team fell 58-35 against the Netherlands in early morning action in Sheffield, U.K.
Canada edged Japan in the first of two games on the day for the Canadian women. Arinn Young picked up a double-double with 27 points and 10 rebounds and Cindy Ouellet fell one rebound shy of the same feat, scoring 24 points and adding 9 rebounds for Canada in the opening contest. Rosalie Lalonde led all players with 7 assists. Canada set the tone early in the first quarter en route to a 17-8 lead. Japan countered in the second frame and erased the lead as both teams entered halftime deadlocked at 21. The heated battle continued in the third quarter with both teams exchanging the lead multiple times throughout the period. When the dust settled, Japan held the advantage by a single point, 36-35, entering the final quarter. 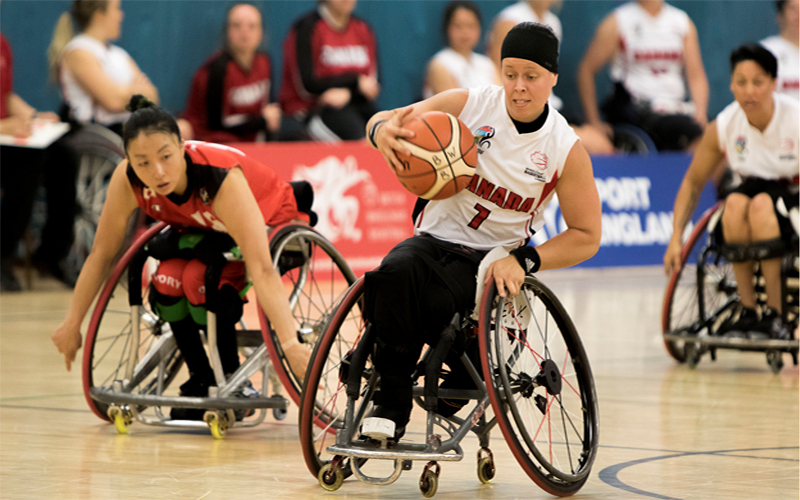 Japan stretched its lead to five points, but ultimately the Canadians stormed back with a 24-point effort in the last quarter to secure the 59-52 win. “The Continental Clash is a good opportunity to gauge where we are leading up to the World Championships,” said Team Canada veteran Melanie Hawtin. On the men’s side, Patrick Anderson tallied a double-double with 23 points and 13 rebounds, while Ben Moronchuk and team captain Bo Hedges each added 6 points for Canada in the loss against the Netherlands. Canada pushed the pace to a five-point lead early in the game before the Dutch went on an eight-point run to close out the opening quarter with an 11-8 lead. After trading baskets to open the second frame, the Canadian shots failed to find their mark while the Netherlands seized the momentum to build a 29-13 lead at halftime. The Canadians rediscovered their scoring touch in the third quarter, but the Dutch kept pace with the resurgent Canuck offence to carry a 39-25 edge going into the final quarter. Despite the gap, Canada showed no quit in the effort to chip away at the deficit in the final frame but the Netherlands shut down any attempt at a comeback and stretched the lead in the final minutes to take the game 58-35. Next up for the Canadian men is a match against Poland at 7:30 p.m. BST (2:30 p.m. EDT) on Tuesday. The Canadian women played their second game of the day on Monday evening in a 65-56 loss against the Netherlands, splitting their record at 1-1. Young once again led the way offensively for Canada with 25 points and 13 rebounds for the double-double. Lalonde and Ouellet chimed in with 8 and 7 points, respectively, while Kady Dandeneau and Maude Jacques both had 6 points. Both teams started with the offences clicking well early in a closely matched opening quarter, with the Dutch taking a 20-15 lead after 10 minutes of play. The storyline continued in the two middle frames, with the defences tightening up slightly while each team kept pace on the scoreboard. The Netherlands maintained their six-point advantage, with a 31-25 lead at the half on the way to a 43-37 lead after three quarters. It remained a six point game until the final two minutes of play, when the Dutch stretched the lead from the free throw line as the Canadians ran into foul trouble. Young once again closed the gap to six points with a clutch three-pointer, but the Netherlands would close out the game with a free throw and a basket off an offensive rebound to claim the 65-56 win. The Canadian women will take on Germany in their next match at 12 p.m. BST (7 a.m. EDT) on Tuesday. The 2018 Continental Clash is a high performance exhibition tournament featuring six men’s teams and four women’s teams that runs from July 2-6, 2018 in Sheffield, U.K. All teams are gearing up to compete at the 2018 IWBF World Championships in Hamburg, Germany in August.